Looking to replace a 60 watt candelabra with an LED? WholesaleLED.com now carries a powerful 7 watt, 700 lumen LED candelabra for as low as $9.95 each. The candelabra features a new, sleeker design, and is more compact than previous models. It measures only 4.25 inches long, including the base, and has an elegant metallic design. With 700 lumens of warm white light, this LED candelabra is one of the brightest out there. The 60W Equivalent Joshua series 7W LED Candelabra has been tested by our quality assurance team, and features a no-questions asked five year guarantee. This LED works in nearly all existing fixtures and is compatible with most dimming systems. It has a standard E12 (mini) base and fits great in most chandeliers or sconces. What kind of LED lights do you need for your next lawn and landscaping project? Whether you are a professional landscaper, or doing a home project, this guide can help! There are a few basic types of LED lights frequently used in landscaping. Learn more about the different options below. MR16 LED light bulbs are often used in landscaping fixtures along walkways or on trees. They have two small prongs at the bottom that click into place. They usually run on 12 volts. It's important to find an MR16 LED that will be bright enough for your application. Here's a link to several that LED MR16s that can replace and 50W halogen. Unique LED post top lamp lights up the ground. Post top lamps are very powerful lights used in post lamps or street lamps to light pathways or open spaces. Most LED post top lights only shine in a few directions, often leaving the ground dark. The post top pictured to the left, features sloped sides, which focus the light where needs to be. You can learn more about this LED post top here. 60 Watt Equivalent LED Candelabra Bulbs Are Now Available. More than 700 lumens of warm white light make this the brightest LED candelabra. The New 7 Watt LED Candelabra replaces a 60 watt incandescent candelabra light. The light, exclusively available from WholesaleLED.com is now available on its store. Is it Really as Bright as a 60 Watt Candelabra? Energy Star regulations require a light to be more than 500 lumens in brightness to claim to be a 60 watt equivalent. Most 60 watt candelabra bulbs are between 600-700. The new 60 watt equivalent LED candelabra from WholesaleLED.com comes in at the upper range with 700 lumens of warm white light. This makes it one of the first LED candelabra bulbs on the market to truly replace a 60 watt candelabra. For a while now there have been claims that it was impossible to make a 60 watt equivalent LED candelabra. But in fact, it was really only a matter of time. As LED lights become more efficient, they are able to produce more light using less electricity. That's why this new generation of LED candelabra can replace a 60 watt bulb while using only 7 watts of electricity. Something that would have been impossible two years ago. Some features to compare to other's when shopping for LED candelabras. Brightness: 700 lumens. Twice as bright as previous generations of LEDs which had only 350 lumens. Warranty: 5 years, even when run 24/7. Most warranties only cover the bulb being run at 3-5 hours per day. Light color: This bulb features a beautiful, warm white light. No bluish or cold white color. One of the best application for energy efficient LED lights is in landscaping. Landscaping lights are typically turned on for between 8 to 12 hours each night, and quite lot of energy. Using LED landscaping lights can reduce the energy usage by as much as 80 percent. There are various applications for LED lights in landscaping. Some of the most common are two pin lights called MR16s and area light or flood light fixtures. LED MR16s are often used in landscaping applications that call for a smaller light source with a spot light beam angle that can be easily directed. These are often used to light trees, sculptures or other sections of architecture that the designer wants to highlight. Most LED lights run on 12 volts, which makes it a safer option in places with potential water contact. While there are waterproof LED MR16s, that specification is not always necessary, as many outdoor fixtures are waterproof to begin with. The product shown here currently retails for less than $6 each and will replace a 30 watt halogen bulb, while using only four watts. Another common application is the area light fixture. These are large, box shaped light fixtures that use a reflector to send an extremely powerful light out at a wide beam angle. These are often used outdoors to light walls and other pieces of architecture, or for lighting up large areas such as walkways or building perimeters. Most quality LED flood light fixtures are IP65 rated, meaning they are weatherproof and can be exposed directly to the elements. LED ceiling can lights come in a variety of shapes and sizes. Make sure you find the right one with this complete guide to LED Ceiling Can Lights. Most LED can lights use one of two types of bases. The Standard E26 base--the screw in base that you find on most light bulbs--or the G24 multi-pin base. 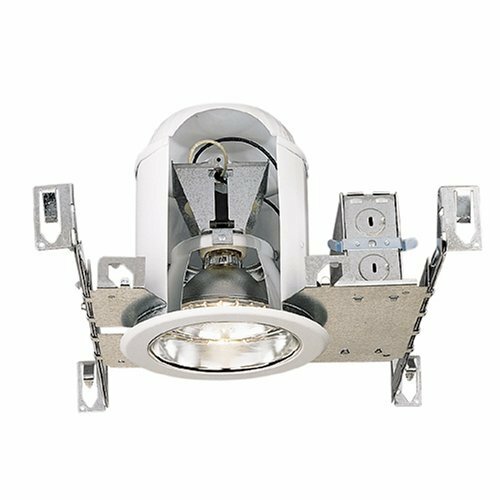 Most recessed fixtures that use the E26 base can be easily replaced by LED lights. All you need to know is which diameter bulb you need. You can determine this by measuring the diameter of the can and then compare it to the chart below. You will also need to pay attention to the depth of the can fixture, as PAR lights do come in both long neck and short neck versions. Some can light fixtures will have a ring or 'halo' around the face of it to conceal part of the light. Or it may use a gimbal that allows the light to rotate. Either of these will still fit almost any LED PAR20, LED PAR30 or LED PAR38 as the bulbs are manufactured in standard dimensions that match the older halogen equivalents. Converting the ceiling cans to LEDs is simple. No special electrical work is required. Simply match the correct size PAR LED for your fixture, then unscrew the old bulb and screw in the new LED light. If you have a dimmer switch attached, make sure that the light that you choose is a dimmable LED light. Ceiling cans using the fluorescent G24 bases mentioned earlier in this article can also be replaced by using an adaptor, but will require that the ballast be removed by a certified electrician. Can LED Lights Be Used in Any Fixture? The shortest answer is yes! LED lights can be used in any fixture your current lights use. Exceptions to this are few and far between. Can LED Lights Be Used in Any Fixture? The Answer is Yes! Below is a brief explanation of some of the most common fixtures in use in the United States and some of the LED lights that will work in the these fixtures. MR16s are a type of bulb that feature two sorts of bases. The GU10 and the GU5.3. MR16s are usually a little less than two inches in diameter and two inches in length, not including the pins. LED MR16s are made to match these dimensions and are made in both base types. Bulbs with a standard base, called an E26 can also be used on track lights. These are usually called PAR-shape bulbs, because the halogen bulbs used a parabolic reflector to direct the light. LEDs lend themselves well to the spotlight design, and so there are LEDs for virtually every kind of track fixture. LEDs are available in all of these sizes. Tracks with a medium base come in a variety of designs, which most LED lights should fit. Gimbal Fixtures: These have a "halo" shaped ring that fits over the face of the bulb, and often have a cap over the socket which is attached by a cord. This then screws onto the base. The ring gives it a clean look and makes it easy to rotate the lights. LED lights use standard dimensions, so there should be no issues placing most LEDs into these fixtures. "Can" fixture. These units have a socket for the base that fits a standard bulb. They may have a "can" shaped metal shield that the bulb fits into. This covers the bulb completely. LEDs will have no problem fitting into these. But make sure to check the length of the bulb vs. the length of the can, as the bulbs come in both long, and short neck variations. These include most "Juno" and "Halo" type lamp fixtures, if you are familiar with those terms. PAR38: Can fixtures using a PAR38 have a 5" diameter. A standard LED PAR38 will easily fit into this fixture. G24 fluorescent lamp: These use a two pin or four pin locking system to lock the 2-3" fluorescent tubes into place inside of the can. It is possible to use an LED in these systems by attaching a G24 adaptor to a standard E26 base. But the G24 uses a ballast to change voltage, and this will have to be removed so that the LED can receive the standard 110 volts. T8 and T12 fluorescent lights come in sizes between 1-8 feet in length. They use two pins on either end of the tube to lock into place in the fixture. These are the most common lighting in offices and other work environments. LED tubes come in 1", 2", and 4" sizes. Many will require you to bypass the existing ballast in order to install the LED. Chandeliers and wall sconces typically use candelabra shaped lights. These bulbs often have a glass dome that mimics the look of a candle. Typically they use a smaller E12 screw in base, rather than the medium E26 base found on a standard light bulb. LED lights are available in the candelabra shape and with both E12 and E26 bases. LED lights have grown more popular in the last few years. In no small part because they are very efficient, environmentally friendly, and very quickly falling in cost. But how does an LED light bulb actually work? Read on. The first LED, which stands for Light Emitting Diode capable of emitting visible light was first invented in 1962. These lights were very low powered compared to other types of lights, but not very bright. It was the same little red light that you would find flashing in your remote control. Early experiments with using LEDs for illumination were largely unsuccessful, partly because of low light outputs. In 1994 the first high brightness LED lights were tested, however they had a bluish-white shade of light that was very unpopular. It wasn't until 2006 that scientists discovered that coating the LED in a phosphor would change the light spectrum to almost any color, including the warm white (yellowish glow) typically found in lighting. These lights are called "high powered" chips and have been used in LEDs for years. Surface mount chips (SMC) and "Chip on Board" (COB) are thinner wafer like LED sets that emit light in a more even pattern and are typically much more efficient. LED lights use anode and cathode to control the direction of the electrons moving through the device. This allows the electrons to recombine, releasing energy in the form of photons, or light. What's in an LED Light Bulb? LED Chip: The LED chips are typically arranged in an array inside of the LED. There may be 4-15 "high powered" diodes, or a single COB wafer measuring an inch or so across, or as many as 75-150 smaller, square SMD chipsets. Lens or diffuser: Since LED lights only shine outward in a 120 degree beam, lenses can be used to concentrate the light down to as low as 15 degrees. Or a glass dome can be placed over it to disperse the light in nearly 360 degrees. Driver: Below the array of chip there is a circuit board that houses the driver. The driver takes the 120 Volt AC used by most American lamps and fixtures and converts it to the low voltage DC current needed to run the chipsets. Heatsink: The housing for the entire unit is usually made from aluminum or another heat conducting material that will move the heat produced by the driver away from the components of the LED. This keeps the unit from overheating. On some of the high powered units it may even use fins and ridges of aluminum to increase the surface area and improve heat dispersion. Base: Finally the cap on the bottom of each light uses a standard E26, E12, etc. so that it will connect to a standard light base. What Color Temperature Should I Use? WholesaleLED.com. Awesome Inc. theme. Powered by Blogger.